Today we are going to share the tutorial on How Apple MacBook Air and MacBook Pro Laptop users can Download and Install Chromium (Chrome) OS On Apple MacBook Pro and MacBook Air Laptops with simple and easy steps and guide. We all know that Chromium Operating System is the open-source platform version of Google’s Chrome Operating System which is a Linux-based operating system developed by Google and Chromium team which provides full support to web apps instead of native desktop apps. It has been built for those users and people who want to get hyper-connected and live and breathe in the online world of Internet. Google with the collaboration of Samsung have already introduced the Chrome OS device known as "ChromeBox" and a Laptop named "ChromeBook" with the integration of advanced and updated Chrome Operating System pre-installed in it. You can read about Samsung's and Google's ChromeBook Laptop and ChromeBox device details here. A UK-based web-developer and hacker named Liam Mcloughlin a.k.a. Hexxeh has developed and managed to install Chromium OS on Apple MacBook Air and MacBook Pro Laptops successfully. 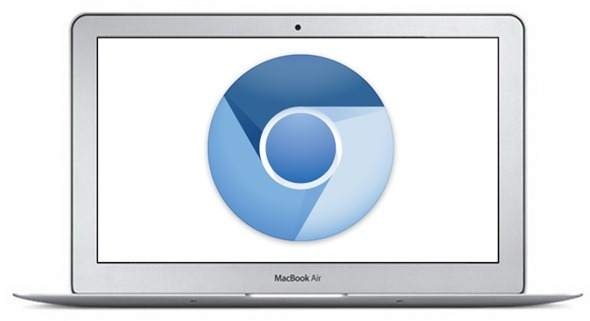 In this blogpost we will show MacBook Pro and MacBook Air Laptops users How to Download and Install Chromium (Chrome) OS On Apple MacBook Pro and MacBook Air with simple easy steps and guide. Hexxeh has made it possible for every Mac Laptop users to install Chromium OS on any MacBook Laptops. First of all users need to know that installation process of Chromium needs careful attention, we don’t want and expect newbies to apply this method because advanced computer-related knowledge is necessary for this tutorial and guide. We at TechGlobeX are not responsible for any damage incurred to your device as a result of following this tutorial and guide because you’re going to remove all of your data by following this guide! We are not responsible for any data loss; make sure you backup your data first. Before you start this process, please note that in order to install Chromium OS on your MacBook Pro and MacBook Air Laptops you will have to wipe out your existing Mac OS X installation. So let's start the Tutorial and Guide of Download and Install Chromium (Chrome) OS On Apple MacBook Pro and MacBook Air Laptops. How to Download, Setup, Install and Run Chromium (Chrome) OS On Apple MacBook Pro and MacBook Air Laptops? First you should check out and read the guidelines and instructions involved with Development and Testing of Chromium (Chrome) OS for MacBook Pro and MacBook Air Laptops from here. Now follow the following Steps and Guidelines to Download, Setup, Install and Run Chromium (Chrome) OS On Apple MacBook Pro and MacBook Air Laptops. Step 1: Download the 237MB ISO Image File of Chromium OS from here. Extract it with any suitable decompression software. Step 3: With your MacBook Air/Pro switched off, plug in the USB on which Chromium OS’s image is burned along with the OS X install drive. Step 4: Now hold down the “C” key on your keyboard and simultaneously press the power button, once you see the Apple logo, let go of the “C” key. Step 5: You should now see the language section, choose the one that’s right for you and click on next. Once the install wizard appears, now you’re going to click “Utilities” which should be at the top, and after that run Terminal. Step 7: Once it’s done doing its thing, hold down the power button of your Air/Pro till the point of shut down. Step 8: Remove OS X install drive and as well as the Chromium OS bearing USB from your MacBook Pro or MacBook Air. Step 9: Now power on your Air/Pro Laptop, and wait for round about 22 seconds. Step 10: Congratulations!! You're done and now you should see Chromium (Chrome) OS Contents On Apple MacBook Pro and MacBook Air Laptops. Troubleshooting: If you're still getting any problem or error when implementing the above methods than you should refer to this link. BEWARE: The above Content and Tutorial is purely for informational purposes only and we at TechGlobeX are not responsible for any damages, software and hardware loss occurs when implementing above method and procedure. Downloading and installing cracked apps are illegal. The whole purpose behind above tutorial and guidelines is for app testing and we encourage peoples to purchase original app directly from App Market.